The village of Bayfield, with a population of about 1,000, on the shore of Lake Huron in southwestern Ontario is both a tourist attraction (with a heritage main street, sandy beaches, shops and restaurants) and an mecca for retirees coming from the cities of central Ontario (Slide 2, map of Huron county). It is also the source of major tax income for the municipality of Bluewater, which includes farms (producing beans, pigs, fairy, corn and wheat) and several other villages. 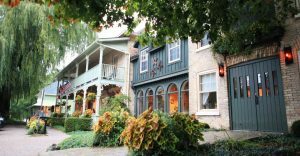 Retirees are attracted to Bayfield’s tree lined streets, green parks, and attractive cottages and full-size homes. (Slide 3 Main Street Bayfield) These incoming retirees want to live here, and bring with them skill sets from successful careers and expectations of public services developed while living in major urban centres. The municipality of Bluewater, created as a result of the amalgamations of the Harris years, lacks the resources to meet these expectations, which are not supported by many of long term rural residents. 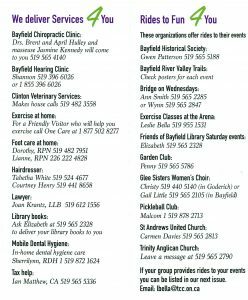 As a result, volunteers within the community of Bayfield have created many of the organizations and services that are attractive to recent retirees. 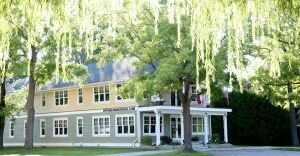 These include recreation activities (fitness clubs, bridge afternoons, a croquet club, a ukulele group), cultural organizations (supporting the Town Hall, the Friends of the Library, the historical Society, the Artist’s Guild) and environmental organizations (a trails association, a tree committee, Blue Bayfield.). In the context of this vibrant community life, local volunteers came together in 2014 to create Home4Good, (Slide 4: Home4Good Volunteers) with the support of local community organizations and local service providers, dedicated to creating an age friendly community in which people can continue to live at home for as long as possible. An initial needs assessment involved interviews with seniors who had recently had to leave the community, or who were approaching the age when leaving might become necessary. The results of this needs assessment were presented to a community meeting attracting 80 residents in May 2015. They collectively identified three priorities, with volunteers recruited to work on committees on each priority. A coordinating committee includes several representatives from each of these three committees as well as representatives from key local agencies such as the local pharmacy, the health unit, the library and the municipal councillor. Some corresponding members attend regularly while others are “corresponding members” who receive agendas and minutes and can be called upon for help when appropriate. Housing: The village of Bayfield consists primarily of single family homes, and retirees eventually reach the point where maintenance of a home and garden becomes too burdensome. Some can purchase town homes more suitable for older residents (eg. The Mews and the Meadows), but those wanting rental housing or needing supportive housing must move to another community. Home4Good’s housing committee is working on this issue, but is the lack of sewer capacity is preventing further suitable development. Homesharing is a promising option (www.nesterly.io). Transportation: Respondents to the needs assessment claimed that when they could no longer drive they would have no choice but to move to another community where walkability and public transportation were a higher priority. Home4Good’s transportation committee, which is the focus of “Surviving without Wheels”, focuses on supporting those whose driving is limited. Information: Respondents to the needs assessment made their confusion about resources clear to Home4Good, suggesting that increasing access to usable information about services and resources should be given a high priority. This is the work of our information committee, which is the focus of another paper prepared for this conference by Roma Harris et al, It is good to know there is someone who knows: Creating a seniors Info Hub. 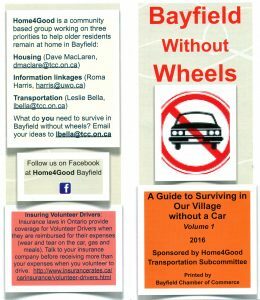 Bayfield without Wheels Volume 1 2016: (Slide 6: Surviving without Wheels 2016) The transportation committee began work in 2015 by developing a brochure of information for those trying to survive in the village “without wheels”. Committee volunteers contacted all local voluntary groups, explained their project and invited the groups to name someone who could be called by someone who needed a ride to their events. Nine groups responded positively and were listed in this first brochure. Volunteers also contacted local services to identify those who would deliver services to people’s homes. Nine businesses willing to deliver goods and services to people’s homes were identified, and included in the brochure. The committee researched the available transportation services (including taxis, and the Easy ride service for seniors and those with disabilities), and presented this information together with an estimate of the cost of running a car and the statement that “you can take a lot of taxi and Easy rides for $10,000”. The brochure was printed with support from the village’s Chamber of Commerce, and distributed widely. Telephone Blitz: In preparing Bayfield without Wheels the committee struggled to identify ways for those without wheels could get their groceries. 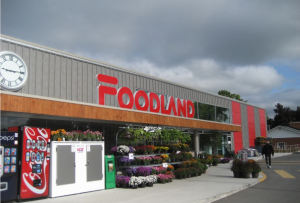 The local grocery store was not cooperative, (Slide 7 Bayfield’s Foodland) claiming it was against the policy of head office and potentially unsafe. Our calls to head office revealed the local franchisee could make the decision, leaving us stuck! So we decided to conduct a telephone blitz, phoning every number in the village and asking respondents whether they would use a grocery delivery service or a local bus service, and how much they would pay for such a service. We constructed a telephone list from various phone books, recruited 25 volunteers and arranged with the Virtual High School on the village’s Main Street (Slide 8 Virtual High School) to use their phones for an evening in early March 2016. We had technical difficulties. While we had twentyfive phones they were routed through a single a computer with limited capacity and many of us had to use our own cell phones. Many of the phone numbers were “not in service” (75%), probably because they belonged to snowbirds or cottagers who had service suspended during the winter. However, volunteers made 946 calls and identified 31 potential bus customers and 23 would said they would use grocery delivery. Transportation committee members followed up with these individuals, and found that many had said “yes” about using these services because they thought they might need them in the future, not because they needed them right now. Those actually needing transportation right now were told about services available from Easy Ride. It seems that those who would have needed the service may already have left for communities with more accessible services and public transit. 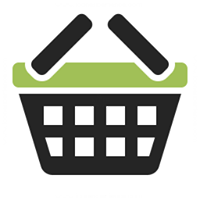 Shop4you: (Slide 9 Shop4You) Armed with a list of potential users of grocery delivery, we advertised in the village on line newspaper (The Breeze) for someone willing to develop a grocery delivery business. We identified a person willing to do this, and they prepared promotional materials and we promoted their initiative on our facebook page, on our website and in newsletters distributed at community events. (See Appendix 2) We contacted those identified in the telephone blitz as interested in grocery delivery, and told them about the new service. Shop4you was not successful with only one person using the service and not repeating the order. Our analysis suggests that the charge for the service was seen as too high. We revisited this issue when we developed the second issue of Bayfield without Wheels in 2018. 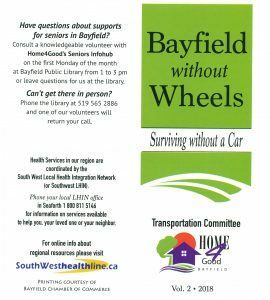 Safe Driving for Seniors: (Slide 19 Safe Driving for Seniors) A representative of the County Health Unit who participated in our coordinating committee asked if Home4Good would sponsor a safe driving for seniors workshop in Bayfield. The transportation committee was concerned about the content and tone of such a workshop, in which presentations would include representatives from the Provincial police and the provincial ministry of transportation. Members of the committee attended one of these events in a neighbouring county and as a result we agreed but with a number of changes. We wanted the MTO presentation shortened and made less repetitive, and we asked that units on the impact of pot on driving and on distracted driving be added. We also asked that the presenters be available during the break to help participants in the parking lot with the alignment of the mirrors and seat positions in their cars. We also added a unit presented by Home4Good on “when you have to give up your wheels.” Evaluations of the workshop were overwhelmingly positive, and the workshop sponsors have adopted some of our suggestions in workshops in other communities. Libretaxi: https://libretaxi.org/ the transportation committee is always looking out for ways to link volunteer drivers to those needing rides, and learned about the software developed by Roman Pushkin for use in rural Siberia. It works rather like UBER, but without proprietary control. In exploring this we assisted Pushkin by making some videos showing how libretaxi would work in Bayfield, for which he paid Home4Good $200 US. However, after a number of attempts to get members of the transportation committee to use libretaxi it became evident that this would not work for the population “without wheels”. Some people are stopped from driving by vision issues and others by cognitive impairment, both of which would prevent effective use of the smart phones on which libretaxi is dependent. Bayfield without Wheels, vol. 2, 2018 (see appendix) By 2017 the 2016 brochure was dated and needed renewal. Also, we had a logo donated by a talented graphic artist which we wanted to use to give continuity to all our materials. We again contacted groups, and added another group to the list offering rides to their events. This identified 12 businesses and groups offering to deliver services to the home, adding a lawyer, a chiropractor, hairdressers, foot care specialists and a dental hygienist. (Slides 15, 16, 17: Surviving without Wheels 2018) Under sources of rides we added a driver who will take you to the airport in your own car and a website sponsored by the region’s municipalities to enable ride sharing. 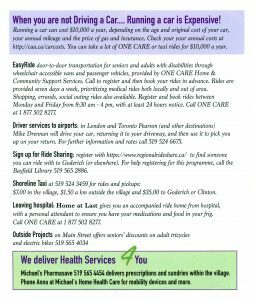 (Https://www.regionalrideshare.ca), an option less complex than libretaxi for older residents of our village. We also included “home at last”, offered to those discharged from hospital which includes both the ride and some help settling at home. This expansion suggested that the 2016 version had educated community leaders, with a greater willingness to step up and offer to be included. an on-line resource with generic health service information for southwest Ontario, and directed readers to the SouthWest Local Health Integration Network (or southwest LHIN) which coordinates health services in our region. 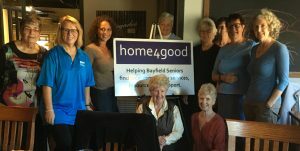 Finally, for access to more local and personally directed information, we included information about Home4Good’s Seniors Infohub developed in collaboration with the Bayfield public library. 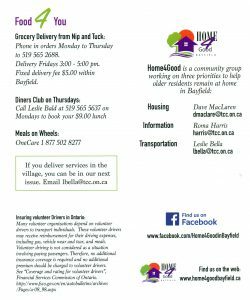 In updating this brochure we again addressed to the food delivery issue, and included meals on wheels. We added the local diner’s club which offers weekly meals at reasonable prices. In terms of grocery, after unsuccessfully consulting Foodland again, we looked at other options. We noted the advertisements for meal delivery services from restaurants, but no local restaurants participate. We noted that a Zehr’s in Goderich will take on line orders and prepare them for pickup, but delivery by taxi would be prohibitively expensive and we do not yet have a pool of volunteer drivers. However, this is a future possibility. However, we have developed another resource within the village for delivering groceries to people’s homes. A local convenience store (The Nip and Tuck) has agreed to take grocery orders for delivery, with orders phoned in during the week and delivered on Friday afternoons. This has been well received, particularly now Home4Good has worked with Nip and Tuck to develop and promote a list of products which includes prepared meals, meat products and baked goods all from popular local suppliers. Participating in efforts to develop public transportation in our rural area, and supporting the needs assessment currently underway to ensure that it recognizes the needs of seniors. 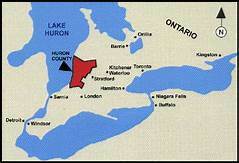 Huron County and Bayfield Ontario.